American Idol’s Disney night (April 29) was certainly magical, and it showed in Gabby Barrett’s performance. The teen proved she’s not a one-trick pony with her take on an iconic Disney song, and it definitely worked because Gabby Barrett advanced to the Top 7! Gabby Barrett brought the classic Disney charm to the American Idol stage with her rendition of Pocahontas’ “Colors of the Wind.” Barrett proved she’s got the versatility to make it and it shows. Our Gabby Barrett wiki celebrates this talented songstress who could be the next Carrie Underwood. Hailing from Pittsburgh, Pennsylvania, Gabby Barrett’s audition for American Idol had a bit of a rocky start. She started off with her idol, Carrie Underwood’s “Good Girl.” But Luke Bryan, Katy Perry, and Lionel Richie were less than impressed. Hoping to see what she was really capable of, the judges persuaded her to sing something that was less Carrie Underwood and more Gabby Barrett. Ultimately, a church song worked for her, and she got a “Yes” from all three! “You can sing country music, you can sing soulful music, you can do a Disney song like that — great job,” said Luke Bryan, adding that Gabby has everything to win American Idol. In a first this season, three contestants were sent home after last night’s performance! But Gabby’s performance took her to the Top 7 with ease. Gabby’s father, Blase Barrett, noticed that his daughter was a vocal powerhouse when she was just nine years old. It all started when he and his daughter were walking in Pittsburgh’s Homestead neighborhood and came across a group of women from a church choir. He told the women that his daughter was a singer, too, and Gabby gave them a small demonstration. Impressed, the ladies invited the nine-year-old to their church, where the local pastor asked her to perform. Gabby’s rendition of Michael Jackson’s “Man in the Mirror” blew everyone away. Not only was she the only white person in the all-black choir, but she was also the youngest. However, the choir and the church welcomed her and her talent. Her singing career has only soared from there. She has since won “The Kean Quest Talent Search” in 2014 and has become a local celebrity in Pittsburgh. Gabby Barrett’s YouTube channel, with over 12K subscribers, features cover videos as well as her original songs like, “Your Name on It.” She even released an album, 16, on iTunes and Google Play. One of her songs, “Young Blood,” was featured in a national ad campaign. She performed at a Pittsburgh Pirates home game and sang the national anthem at a Pittsburgh Steelers game and the Daytona 500. With her star continuing to rise, Barrett’s dad is now her manager. Gabby is one of eight children born to Blase Barrett and his wife. From the looks of it, she’s a real daddy’s girl! Even on the American Idol stage, she’s taken the opportunity to thank him and point out how grateful she is for all he’s done for her in life. Gabby also has a close bond with her siblings. She even dedicated one of her performances to her sister. Gabby attended Serra Catholic High School in McKeesport, where life wasn’t easy for the teen. While on American Idol, she’s kept no secret about the bullying she experienced at her former school. With a consistently growing performance schedule, Gabby has spent a lot of time on the road. So, she enrolled in the Pennsylvania Cyber Charter School, which is convenient for her schedule. While her dad is always by her side, Gabby’s sister and brother also enrolled in PA Cyber, so that they can travel with her. 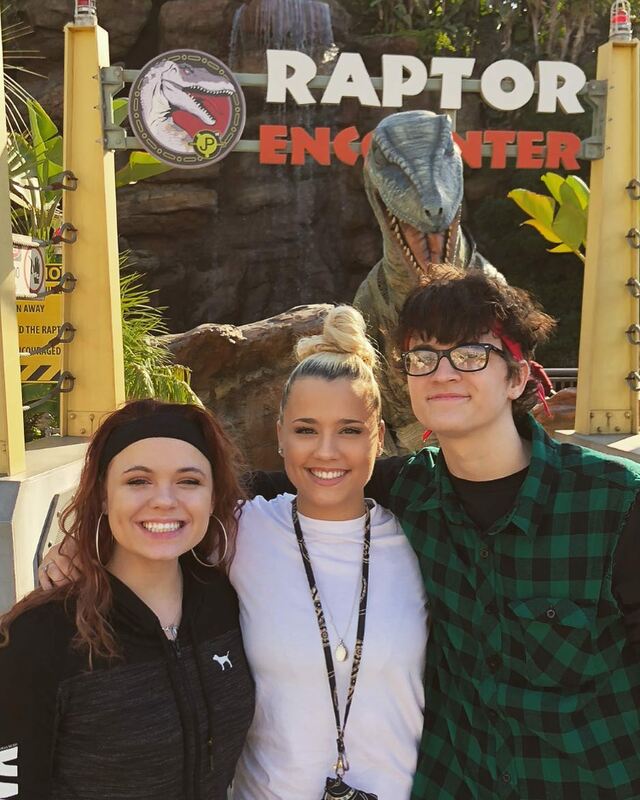 Gabriel and Gypsy Barrett are often seen on Gabby Barrett’s Instagram. Gabby has since become a voice against bullying. She travels to Pittsburgh schools to perform and advocate her anti-bullying message. The 18-year-old plans to move to Nashville after graduating high school to pursue her music career. Until then, she’s shooting for the top prize in American Idol. Watch Gabby Barrett perform on American Idol, Sundays at 8:00 p.m. EST on ABC.